Just a cute photo to start off the week. 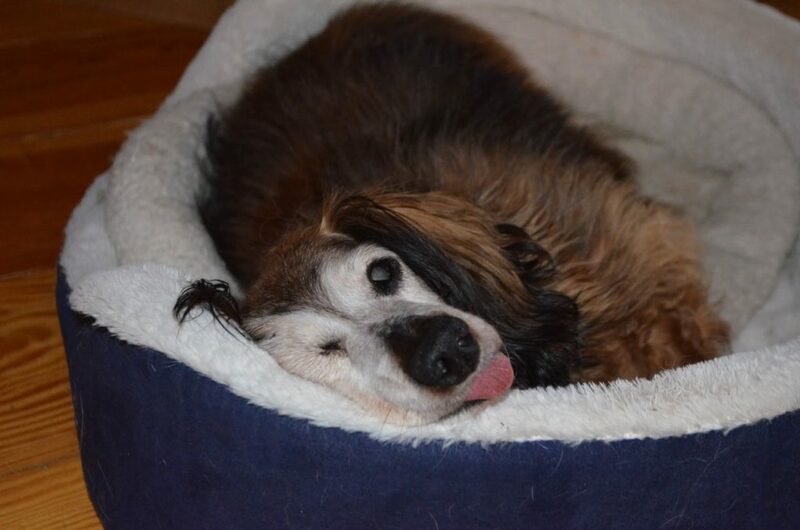 Alayne got this shot over the weekend of blind Sophie, our diabetic Dachshund, sound asleep in the living room with her very pink tongue hanging out. (Nothing wrong with her right eye, just scrunched up because of the way she has her head on the edge of the bed.) Of course, we’ve seen many dogs over the years asleep with their tongues out. It’s always cute, but we’ve often wondered why they sleep with their tongues like this. In the case of those elderly ones missing teeth, i.e., Wilbur, it makes sense — nothing to hold the tongue back in with — but like many of the others, Sophie has a full set of teeth. Whatever the reason, it was working for her! You “think” she was sound asleep but maybe she was expressing her feelings about getting her photo taken while trying to sleep. Either way, she sure is cute. It will be nice when the weather gets warmer and we can get to see some outdoor photos of the doggies we don’t get to see too frequently. She sleeps with her eyes open/??? I’ve known dogs that do that; and it always seems disconcerting to me. She looks so comfy and warm without a care in the world. That’s because she knows she is so well loved. I’m wondering why she is sleeping with one eye wide open. 🙂 I’ve seen dogs sleep and even dream with their eyes open, but not that wide. I’m guessing that being blind makes closing your eyes less of a necessity. As for the tongue, maybe Sophie is waiting for a chance bit of food to drop from the sky. If it does, she’ll be ready. Always look forward to your Monday posts, so I hope all is well there at the Farm.